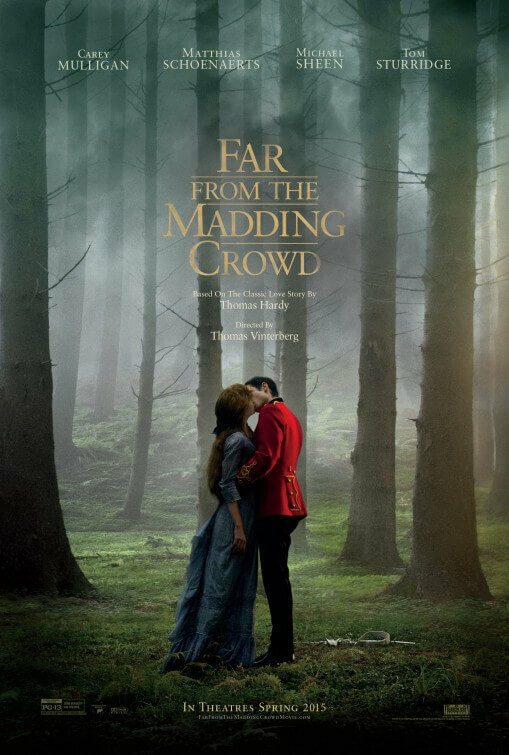 Costume drama fanatics are likely to be in cinematic heaven with Far From The Madding Crowd, the latest adaptation of Thomas Hardy’s classic novel which had previously been famously adapted into a 1967 film with Julie Christie and Terence Stamp. Now with Carey Mulligan and Tom Sturridge filling those roles, as independent farm owner Bathsheba Everdene and reckless army Sergeant Frank Troy respectively, the stage is set for director Thomas Vinterberg – previously Oscar-nominated for his Danish flick The Hunt – to bring his own vision of the classic story to life, and it is nothing less than gorgeous and even at times breath-taking. Nicholls, as a writer, paces his adaptation gently, allowing all the important plot beats of Hardy’s original story to occur whilst compromising some of its outdated attributes. Bathsheba’s strive for independence, for example, is much more prominent and centre-stage than perhaps in other versions before it, and though the romance element is still a very large part of it (with not just Sturridge’s Sergeant Troy in the mix but also Matthias Schoenaerts’ sheep farmer Gabriel Oak and Michael Sheen’s mature bachelor William Boldwood as well, it’s more of a love square than it is a triangle) it’s handled in a way that doesn’t wholly betray her original goals and prospects. By its end, she is still more than willing to make her own decision with no obvious influence, as opposed to Hardy’s novel where, let’s face facts, she didn’t turn out to be as strong as was intended. In favouring the female empowerment aspect of the story, Nicholls has managed to adapt a modernised, yet still timeless, version that will earn the admiration of audiences everywhere amidst a depressing insurgence of sexism and discrimination against women within the industry. Performances are almost pitch perfect from the entire ensemble, with only Sturridge failing to completely convince as the hardened and domineering presence of his character; for whatever reason, he’s simply too boyish for the part. 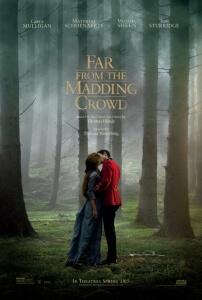 Everyone else fares much better, with Mulligan proving to be a sparky and engaging interpretation of Bathsheba and Schoenaerts perhaps turning in his finest performance to date as the ever-loyal Gabriel (then again, after his bland performance in A Little Chaos, anything would seem Shakespearian by comparison). However, it turns out to be Sheen who impresses the most as the older suitor Boldwood; a man who has clearly been wronged in the past by a lover of sorts, his social awkwardness and worrying lack of true self-confidence makes him a character who would otherwise come across as hugely pathetic, but Sheen is able to humanise him in a way that enables him to be sympathetic and overall good-natured. Any literary geeks will mostly be satisfied with this interpretation, though from what one understands about Hardy’s novel there has been a lot of dialogue and even a little bit of character removed for the sake of timing, and while we’re certain that some people will prefer the 1967 version a whole lot more, you can rest assured that the 2015 film incarnation of Far From The Madding Crowd is a worthy version for a whole new audience.